This is a gorgeous little traveling pistol, 9 1/4" in overall length with a 5" long smoothbore barrel of .60 caliber. The barrel is round with a tapered octagonal breech and a cannon muzzle. The breech has a file worked transition to sixteen sided and then a wedding ring transition to round. 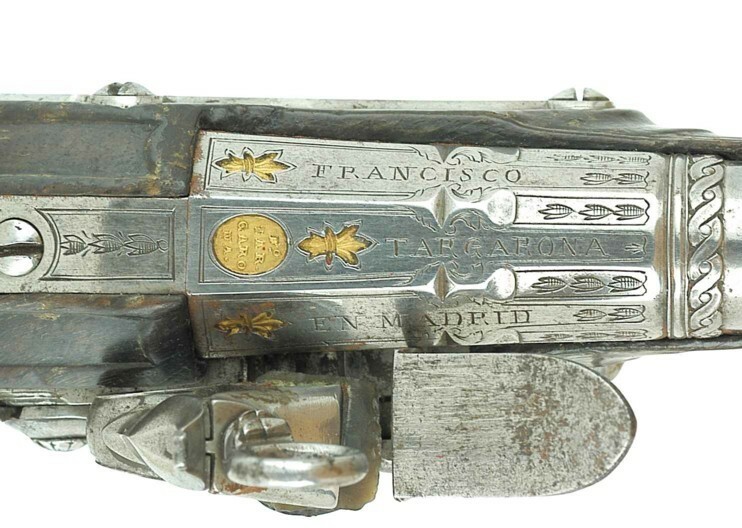 The top of the breech has a gold opinion with "FO/TAR/GARO/NA", the top three flats of the breech bear with gold fleur-de-lis and are marked "FRANCISO/TARGARONA/EN MADRID". The lock shows the influence of the Spanish miquelet and has horizontal sears that prune the lockplate to interrupt the work. The lockplate is carved with a beveled edge and is marked "TARGARONA". The full length walnut stock has raised moldings and engraved all steel furniture.